White and Pink Hues Create Showy Effect! Just plant it, then practically forget it. 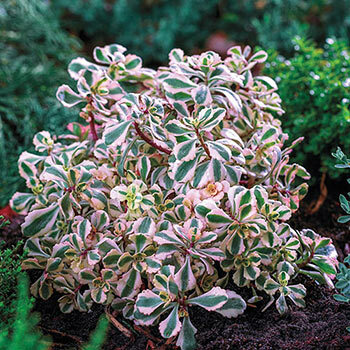 Our Rainbow Sedum is an excellent ground cover with green and snowy-white foliage with overlays of pink. As an added bonus, blush-pink rosettes will appear midsummer. Very drought resistant. 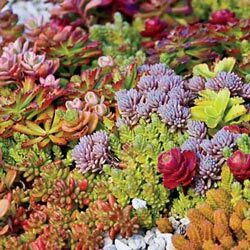 This exciting mix of sedum varieties creates a multifaceted, evergreen carpet display. Performs remarkably well, even in the harshest of conditions! Carefree and easy to grow, it is extremely drought tolerant and does not require fertilizer. These sedums are fully hardy perennials, and will spread to form a dense, colorful ground cover. 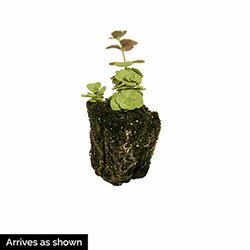 Germination Set plant at same level it is growing at in the container. Firm soil and water thoroughly. 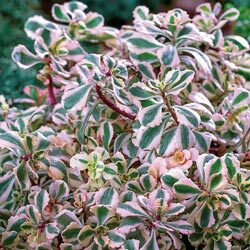 Foliage Type: 3/4" round, green leaves dappled with pink and creamy-white. Flower Form: Small, star-shaped flowers bloom at the ends of short stems. Planting Instructions: In clay soil, rhizomes should be slightly exposed. In sandy soil, they can be covered an inch or two. Full sun is best, at least 5 hours of sunlight each day. Water during dry periods. Soil Requirements: Well-drained, average soil. Does not like to be wet. Pruning: Trim stems and dead head flowers in the early spring. Winter Care: None, except to mulch lightly the first year if planted in fall. Remove the mulch early in spring, before new growth starts.